Michael provided his story for the exhibition that was mounted by the Project in 2003 to mark the 61st anniversary of the Bath blitz. I also found Mike's story in the BBC's WW2 archives (see below), submitted two years later. The BBC permits these archived stories to be reproduced provided it is not for profit. As Mike had provided more information to the BBC than he did for the exhibition, I have also included those memories below. At some time in the night I was called from my bed by my mother, who came back a few minutes later to find me back in bed! We all went down to the only place in the house, which could give any shelter - the cupboard under the stairs. We had no cellar. This time it was different. Not only were there aircraft but there was a continuous noise - of explosions, thumps, cracks and whistling as bombs and bullets filled the air. The noise was thunderous and went on and on. I was terrified. Occasionally in a lull dad would go to the door and look towards the city and come back. We were two adults and three children in a very small space. In the cacophony of sound that ensued I never did hear separately the bombs which missed us by microseconds and destroyed two pairs of houses immediately behind us and in the process tearing apart our house. The front door was blown in and the kitchen door was torn off its hinges (just outside our cupboard) and pulled towards the explosion by the inrush of air into the vacuum created. The back wall of my bedroom was bowed out into a semicircle - again towards the explosion, and the whole of the roof of slates was lifted and dropped back in disarray, followed by a great deluge of debris. However we were unharmed! Bombers seldom released bombs individually, but released a small number (typically 3 to 5) in quick succession. When they reached the ground, they were fairly close together and in a fairly straight line, exploding within seconds of each other. This close set of bombs was known as a "stick" of bombs. In the morning, when it was finally quiet and daylight arrived, dad went to get our Morris Eight from the Chaucer Road Garages (he had a miniscule ration of petrol for Home Guard duties) and I wandered round and up the side road (Milton Avenue) to look at the back. The pair of houses immediately behind us (in Milton Avenue) was a heap of rubble and swathes of timber; most of it cascaded into our back garden, where I saw the state of our house. I learnt later that, fortunately, the Norris's had survived in their cellar, where they sheltered behind a brick wall, but the Francis' next door had not. There were also two fatalities in the pair of houses in the opposite top corner, which had also been destroyed. These two bombs may have been in a stick of three (see panel on right), the third of which destroyed the top two or three houses of Shakespeare Avenue on the school side, just below Alexandra Park. Before I had explored any further, mother came running up and dragged me away, fearful of the danger of unexploded bombs or shells. As we walked round to the car at the front, I became aware of how littered the streets were with rubble and debris. There seemed not to be a square inch of free road space and every roof appeared to be damaged, not to speak of the windows. As we set off, early that Sunday morning, I saw that there were three houses missing in Kipling Avenue, the third to the fifth down from Chaucer Road on the city side, which were just a heap of smoking rubble. As we turned into Wellsway at the foot of Milton Avenue I saw that the Bear Flat was a smoking ruin on the corner where the Bear Hotel had been (Mr. Norris was the landlord at the time). Opposite was the National and Provincial Bank of England, also in ruins. 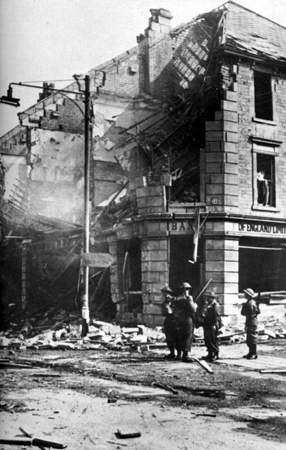 Later photographs would show a soldier standing guard outside the shattered building with the remains of its sign reading "Bank of England"; this corner building is now the home of the local Co-op. During the afternoon I went to play with friends in Southstoke Road near the Cross Keys. Later I became aware of a crowd of people walking down Southstoke Road from the top of Entry Hill. They were walking silently, purposefully, with prams and bags, the whole width of the road, and heading slowly and steadily out into the country and away from the nightmare of the city. I was only seven when the war broke out on September the 3rd 1939. We were having a delayed summer holiday on the south coast because the arranged holiday let in Studland was cancelled at the last minute when the boy living next door to it went down with Scarlet Fever - a highly contagious disease, and we had no anti-biotics available then. We were staying in Corfe Castle (in a flat over the greengrocers) for two weeks when war was declared on the middle Sunday. I remember a terrific argument between my parents about having to cancel and go back home to prepare blackout curtains and so on, culminating in mother getting out of the car and walking off - I can picture the roadside even now. It would have been the last opportunity to relax for years - but we came home of course. Early in the war the Admiralty was evacuated to Bath and requisitioned the Empire Hotel, and built hutments at Foxhill, Ensleigh and the Warminster Road. These latter three are still there and occupied although the main regional centre is now at Abbey Wood, North Bristol. Foxhill hutments were labelled Blocks A to G and the pub opposite, the Forester's Arms, quickly became known as Block H. At first the personnel were billeted out with residents in the city and our "billetee" was Mr. Longford. We followed the news on our radio in the front room; the Home Service and the Forces broadcasting stations, (the latter becoming the Light Programme). There was also, on the dart-board surround on the back of the door, a poster with photographs of the news readers (Alva Liddell, Frank Phillips, etc. ), so that we would be able to recognise any impostors if we met them! We were given identity cards - every family had a four letter and three digit code followed by a forward slash and a further figure, denoting your position in the family (dad 1, mum 2 etc.) mine was WNAC 166/4. The iron railings on top of our front garden wall, and on all the walls along the street, were taken away as raw material for the "war effort". A team with oxy-acetylene torches cut them away to remove them and the scars are still there on the walls and pillars. A "pig bin" was also positioned on each street corner to collect kitchen waste (swill) for pig farmers to feed their stock, because grain and other animal feed became as short as our own rations. Ration Books were issued for each person, with strict limits on each commodity, for example we were allowed just 2 ounces of butter a week each. After Dunkirk there were many defences hastily thrown up to prepare against the imminent invasion. Just south of Bath the "Green Line" was quickly dug - this was a deep anti-tank ditch, which cut across from the river Frome to the Wellow Brook, with anti-tank barricades on the two main roads which it severed - the B3110 and the A36 just north of Hinton Charterhouse and at Hinton Priory. Pill boxes (concrete dug-outs) were built at strategic intervals and large anti-tank concrete blocks (about 6 feet cube) were set into every gap and crossing place of the brooks. This defence may have delayed any advance from the south coast sufficiently to get reinforcements to bear. The site echoed the site of a battle during the Monmouth Rebellion at Norton St. Philip just two miles to the south, when that army, although successful, was weakened and had to eventually retreat from Bristol to be finally defeated at Sedgemoor. Aircraft recognition was important and various leaflets and booklets were made available to the public. These links show (in the second window) the sort of information that Mike would have studied (though the technical details included on these pages would have been kept secret during the war). We would look up at aircraft flying overhead and soon knew the silhouettes of the Spitfire and the Hurricane, the Blenheim, the Beaufighter and the Wellington, and instantly recognised the deep throated roar of the fighters' Rolls-Royce Merlin engines. We also studied the silhouettes of the German aircraft - the Messerschmidt ME 109, the Stuka, the Dornier DO 217, Heinkel 111 etc., and came to recognise the very different sound of their engines. The dual engines of the bombers in particular gave a throbbing 'beat' as they seemed not to be synchronised in the same way as the British aircraft. We became used to the nightly disturbance of the sirens as the aircraft went overhead on their way to Bristol, or Cardiff, or the Midlands from France and the south coast. From our front bedroom window in Chaucer Road, above the Bear Flat, we would count the barrage balloons against the bright evening sky to the north west over Bristol and in the morning see how many were left amidst the smoking debris just twelve miles away. The wail of the sirens, rising and falling, rising and falling, until they at last fell away to an eerie, expectant silence, when you would listen intently for any sound from the sky - however distant, still fills me with an uncontrollable foreboding all this time later. The relief of the all clear, with its long steady note was tangible. We had been to see the odd incident, like the bomb dropped on the Dolemeads near the railway, and the house burnt down by an incendiary in Stirtingale Avenue, and the bomb dropped on one of the gasholders at the gasworks; but these were hit and run raids, probably by aircraft jettisoning a remaining bomb from their load. We also looked out to see the searchlight probing the sky from Penniquick, but never saw it illuminate an aircraft. On one occasion we flocked to the fair ground in North Parade Bridge Road, just by the railway and the traffic lights, behind the iron gate still in the corner - now part of the Cricket Club car park. There we were fascinated to see a Messerschmidt ME 109 on a trailer, shorn of its wings, which had been shot down and was on display to raise funds in the "Wings for Victory" campaign. We delighted to run our hands over this "enemy" aircraft and to see how flimsy it appeared to be. My friends and I started collecting small scale aircraft models (1/72nd scale) and one Saturday afternoon Tom and I made an airfield in the back garden, by a bend in the path, by flattening the soil (it was spring) and using our model fighters to fly off and 'intercept the enemy' - and return successfully! After Tom went home that evening I realised that he had left his model Spitfire behind. I kept it safe for the morrow. Unusually I had completed my weekend homework that Saturday before Tom came - it was more usual for me to do it at the last minute on the Sunday afternoon! I slept upstairs in the back bedroom, which was over the kitchen in a rear projection or wing. This looked out over the garden, where we had had our airfield, and up to the four pairs of houses behind at the top of Milton Avenue. At some time in the night I was called from my bed by my mother, who came back a few minutes later to find me back in bed! We all went down to the only place in the house which could give any shelter - the cupboard under the stairs. We had no cellar. This time was different. Not only were there aircraft but there was a continuous noise - of explosions, thumps, cracks and whistling as bombs and bullets filled the air. The noise was thunderous and went on and on. I was terrified. Occasionally in a lull dad would go to the door and look towards the city and come back. We were two adults and three children in a very small space. In the cacophony of sound that ensued I never did hear separately the bombs which missed us by microseconds and destroyed two pairs of houses immediately behind us and in the process tearing apart our house. The front door was blown in and the kitchen door was torn off its hinges (just outside our cupboard) and pulled to the bottom of the kitchen - towards the explosion - by the inrush of air into the vacuum created. The back wall of my bedroom was bowed out into a semicircle - again towards the explosion - and the whole roof of slates was lifted and dropped back in disarray, followed by a great deluge of debris. However we were unharmed! In the morning, when it was finally quiet and daylight arrived, dad went to get our Morris Eight from the Chaucer Road Garages (he had a miniscule ration of petrol for Home Guard duties) and I wandered round and up the side road (Milton Avenue) to look at the back. The pair of houses immediately behind us was a heap of rubble and swathes of timber, most of it cascaded into our back garden, where I saw the state of our house. I learnt later that, fortunately, the Norrises had survived in their cellar, where they sheltered behind a brick wall, but that the Francis' next door had not. There were also two fatalities in the pair of houses in the opposite, top, corner which had also been destroyed. 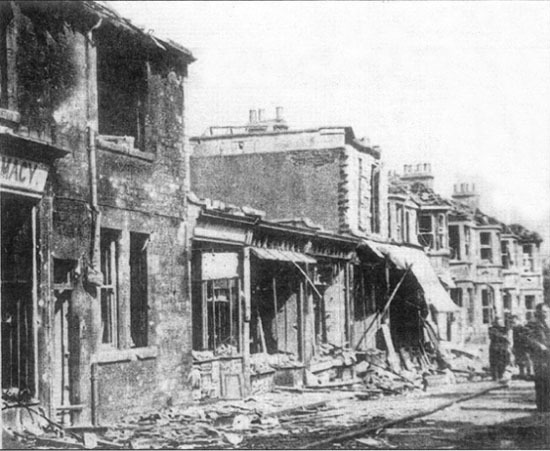 These two bombs may have been in a stick of three, the third of which destroyed the top two or three houses of Shakespeare Avenue on the school side, just below Alexandra Park. As we set off, early that Sunday morning, I saw that there were three houses missing in Kipling Avenue, the second to the fourth down from Chaucer Road on the north side, which were just a heap of smoking rubble. As we turned into Wellsway at the foot of Milton Avenue I saw that the Bear Flat was a smoking ruin on the corner where the Bear Hotel had been (Mr Norris was the landlord at the time). Opposite was the National and Provincial Bank of England, also in ruins. Later photographs (reproduced right) would show a soldier standing guard outside the shattered building with the remains of its sign reading "Bank of England"; this corner building is now the home of the local Co-op. That night we sheltered in that house [in Southstoke Road] while we heard the raids go on, wave after wave again. This time we could hear more of the aircraft noise and the rattle of gunfire as they strafed, and hear and feel the deeper rumble of the explosions. We had no air defences. It would be later in the week before an Ack Ack (AntiAircraft) battery would be set up on the other side of the field from the Cross Keys with its back to the wood by Southstoke Village. The Special Constable from 9 Maple Grove who was killed was Thomas Lott. We stayed there for five days before moving in with my grandfather at 7 Maple Grove, where we would be for five months whilst our house was repaired sufficiently. It was there that we learned that the Special Constable father of the family next door in Maple Grove (Number 9) had been killed in the direct hit on the bomb shelter opposite the Scala at the Shaftesbury Road, Third Avenue junction in Oldfield Park (now a Memorial Garden). My sister, Jill, reminded me that when we eventually returned home we took with us a Morrison Table Shelter, which had six steel uprights, a sheet steel top and wire mesh sides. It was perhaps a little more secure than our cupboard under the stairs, but didn't feel so safe! We also went shopping again on the Bear Flat. Tilley's, the grocers (Number 32 Wellsway), was still there, where you could buy your sugar ration, and other dry goods, scooped loose into bags. Our dairy (formerly at Number 6 Wellsway) was for many months to be housed in a lean-to shed in an alley between the ruins of the Bear and what is now the JCR newsagents/Post Office. McCormack's the newsagents was in Hayes Place (Numbers 3 & 4 - see picture right: Cormacks [not McCormacks] was the shop in the photo with the upper storey destroyed) and was also in make-shift premises, the former owner having being killed there (This is not quite correct - Sidney Cormack was in fact killed in his home at Number 1 Beechen Cliff Road and not in his shop). Holloways', the butchers, were on the corner of the foot of Shakespeare Avenue (at Number 33 Wellsway), where we bought our meagre meat ration, and paid the cashier in the kiosk in the corner of the shop. This shop is now a "deli" but the original meat hanging rails are still there on the ceiling. My school, on the Bear Flat (Wellsway Prep School, at Number 5 Elm Place), had closed on the night of the Blitz, never to reopen, so I had nowhere to go immediately. This was another source of frustration for me as I had done my weekend homework on the Saturday - and now would never hand it in! Mother helped me "cram" for The City of Bath Boy's School (now Beechen Cliff) and I managed to pass an entrance exam and be accepted to start there at 9 years eleven months! It took two or three years to get into my right age "stream"! My wife-to-be, Naida Lawbuary, then a schoolgirl and a friend of my sister Pat, tells how she and her mother had to leave their top floor flat at 29 Gay Street, overlooking the Assembly Rooms, because of the danger to them of the uncontrolled fire that destroyed that building. They walked, in the night, down to the river, by Pulteney Bridge, and then along the riverside to Widcombe and then up Lyncombe Hill to relatives for sanctuary. She described how the whole city seemed to be ablaze in an inferno as they looked across the river. 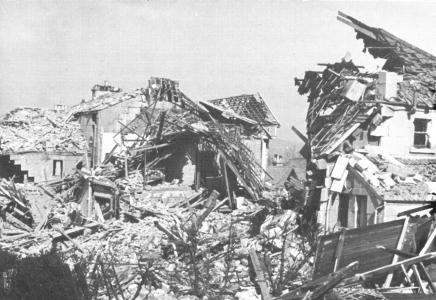 We later learned that the strategy of the bombers had been to use high explosive dropped from altitude on the first long night of raids, and then to use thousands of small incendiary devices from low level, accompanied by strafing (machine gunning) to exploit the damaged buildings and cause uncontrollable fires. This may explain the inaccuracy of the high altitude bombing which took place along the route of the railway, causing virtually no damage to that, but causing devastation to Holloway and Beechen Cliff, Oldfield Park, Railway Street (Bus Station area), Dolemeads and the Lower Bristol Road area as far as Twerton. The other main area being along the route of the Circus, Brock Street and Royal Crescent, but the main damage was caused to Julian Road and other parallel streets. Beyond this other centres were targeted, such as the Bear Flat, Oldfield Park, Kingsmead and the Upper Bristol Road. A large number of churches were destroyed. When we moved back into our house in the late autumn of 1942, I then had only a short step to get to school - indeed because the houses had been destroyed behind us I had a free access into "the boy's field" and could leave at the last minute! Coming home at midday I could also wait until I heard the "field bell" ring before making my way back - just in time! The school itself had been damaged in the blitz by a frontal assault with cannon shells from low flying aircraft and the two upstairs rooms (one a lecture theatre, one a laboratory) either side of the main entrance were burnt out and remained closed for a long time. Damage to the stone work was evident for some years after. Wood from the burnt desks and furniture was used in the woodwork room, consisting of some good quality hardwood. Mr. Chancellor, the master, made good use of it and I still have a couple of items, which I made at that time. Michael thought that more people died in his area than the records show. There is nobody with the surname Francis on the list of those killed, so it is likely that either they were not at home when the bomb struck, or their family was badly injured, but survived. The houses in the "opposite top corner" included the house in which the Gait family lived. Only Margaret Gait is listed as killed. All the families named lived in Milton Avenue. The Gait family lived in the house named Parklyn. The Norris family lived in the house named St Ives. The Francis family lived in the house named Beverley. The photograph that illustrates Michael's story was taken of Numbers 105 and 107 Shakespeare Avenue, probably destroyed by the last bomb in the stick of three that Michael referred to. However, there is a discrepancy between the Government records and Michael's story. According to the Government records, the bombs that hit Milton Avenue fell on the first night, but they show that two bombs landed in Shakespeare Avenue on the second night. I am inclined to believe that Michael remembers correctly and that there was a bomb on Shakespeare Avenue on the first night, but that a second bomb fell in almost the same place the second night, and the Government inspectors wrongly recorded two second night bombs. Michael thought that three houses in Kipling Avenue had been destroyed. The City Engineer's survey revealed that two (Numbers 24 and 24a) were so badly damaged that demolition of what remained was necessary for public safety, but that the other badly damaged houses in Kipling Avenue could probably be repaired. The bank that is mentioned was on the corner of Bruton Road and Wellsway. It is the one that Rex guarded. In the BBC archive, this memory was Article ID: A4438938.